Payments for ecosystem services have become common policy tools used by governments to mitigate the damaging impacts of threats to natural systems. Our transdisciplinary, international research team encompassed 35 interdisciplinary scientists, students, and non-academic partners who collectively studied the impacts that the Mexican government’s payments for hydrological services program has had on the surrounding landscape and people. The overarching goal of our research was to advance understanding of interactions and feedbacks between payments for hydrological services policies and coupled social-ecohydrological systems in two watersheds in Veracruz, Mexico. 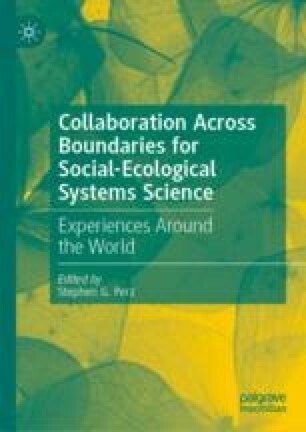 In this chapter, we present the challenges that our team faced while conducting this research, as well as our achievements, not only in terms of generating new scientific knowledge about complex natural-human systems but also to developing transdisciplinary approaches that have the potential to impact policy. This work was supported by the National Science Foundation’s Coupled Human and Natural Systems (CNH) program #1313804. The authors do not declare any conflicts of interest and any errors or misinterpretations are the responsibility of the authors. Bernstein, J. H. (2015). Transdisciplinarity: A Review of Its Origins, Development, and Current Issues. Journal of Research Practice, 11(1), Article R1. Retrieved from http://jrp.icaap.org/index.php/jrp/article/view/510/412.